Ceramic cookware is not mysterious and accomplishes the same thing as other cookware—even better with its non-sticking properties. They work well in ovens, in the microwave and on the outdoor grill. Ceramic cookware is inexpensive contrasted with other cookware of stainless steel, cast iron, and other metals. Speaking of contrast, the many fabulous colors will contrast and harmonize with your kitchen décor. Never ever never use cooking oil sprays—not even olive oil from an aerosol can! Your skillets and pans will quickly have a buildup of sticky gook that is never absorbed into the food and never washes away. Looking at an aerosol can of Vegetable Oil Cooking Spray the ingredients state: “soybean oil, soy lecithin, dimethyl silicon (for anti-foaming), propellant, and contains soy for a trivial amount of fat.” Yes, soy sticks, is hard to remove, and we do not want the added chemicals in our food. Scrubbing the film off ceramic is labor intensive and can make the ceramic scratch and peel from trying to remove it. 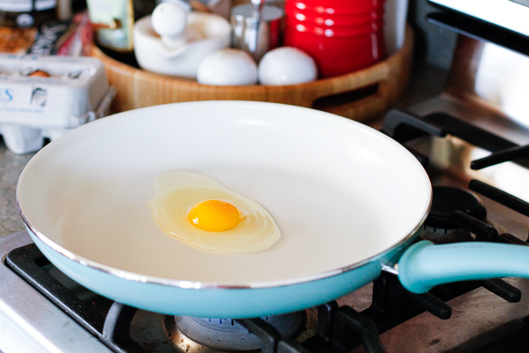 The cooking spray does not burn off and will smoke if the pan is too hot—and you should never get ceramics that hot. Use a little butter or oil rather than cooking spray. Do not use metal utensils in ceramic cookware. It scratches it—use soft wood, rubberized, silicone spatulas, spoons, and tongs to turn foods over. Chopsticks are good too. Harsh abrasive chemicals such as scouring powders and steel wool soap pads, nylon scrubbing pads, and brushes must not be used to maintain the functional finish and beauty of ceramic. Never put ceramics in the dishwasher if the manufacturer does not recommend it. Dishwashers use strong detergents and very hot water than can ruin your cookware. Cook on low-to medium-heat. Very high temperatures are not good for the nonstick coating. After a few times using high heat, your ceramic cookware will be ruined on the surface and could possibly release toxic vapors (that kills birds close by). Season your cookware before using it. It preserves the life of your cookware and will be easier for you to cook your foods. To preseason your cookware, first rinse and dry it. Using a paper towel or napkin, rub a teaspoon of oil all over the inside surface. It’s best to do this each time you cook and only takes a minute—similar to doing when baking a cake. Never leave an empty pot, pan, or sandwich griller on a hot burner; it will ruin the surface, warp and distort the cookware. Do not cut food in the pans; never use mixers and beaters either. Let the pots and pans cool at room temperature before cleaning after each use. What is the Best Ceramic Cookware?